It’s a strange thing but it’s the ultimate dealmaker’s paradox: that special something that makes a business valuable and attractive to would be purchasers is also a matter of utmost secrecy. The question is, as a seller or buyer looking to take a business to the next level, how do you share and scrutinise the inner workings while keeping things under wraps? Of course business integrity and trust go a long way, but sometimes are not enough to keep a prospective deal confidential. Confidentiality – that is the nub. A common feature of many Mergers and Acquisition’s (M&A) is the considerable volume of confidential information that needs to be exchanged between the buyer and seller. Of course, this is perfectly reasonable and necessary for a successful M&A. However, such movement of confidential information leads to the potential for misuse – either by accident or design. So what should such a confidentiality agreement cover? Whilst standard confidentiality agreements abound and all basically cover the same well known clauses and covenants, there are some less obvious points that need to be considered. Below we take a look at some important points what should be covered when drafting a confidentiality agreement. It is not sufficient for an agreement simply not to disclose confidential information. It should be stated that the confidential information is to be used only for the purpose of evaluating the proposed transaction/investment. Look to protect confidential information by only releasing the increasingly sensitive information in phases.While it is critical for a smooth and timely sale process to collect and organize due diligence information in advance, you should only distribute increasingly sensitive information as you progress in the sale process. Use the Right People – As discussed earlier there will be the sharing and transfer of a vast amount of information during the M&A process, so it is important that you trust the people who will have access to that information, much of it confidential and sensitive. Therefore, anyone who is allowed to view such sensitive data must be vetted. Make Best Use of Technology – It is important that companies retain control over their data, and in any M&A, where there will be many sensitive documents, it is necessary to use a highly secure solution that utilises appropriate technologies such as multi-factor authentication, encryption and certified data servers. Implement Safeguards – Trust and technology will not be enough to keep important data confidential. It will be necessary for organisations to institute specific policies and procedures with respect to data management and security. Good intentions can never replace a coherent strategy, and it is critical that all personnel are effectively trained with regard to the company’s data security goals and expectations. In addition, the tone from the top must be clear and all levels of the company must be clear as to the planned strategy and act accordingly. In the end the most effective way to maintain confidentiality is to control the flow of information. However, M&A deals are fast-moving and often founded on trust, but as we have discussed that does not mean that certain measures should not be taken to ensure that closely guarded information stays secret. In fact, confidentiality need not stymie the process or breed suspicion. Indeed, a thoughtful and transparent approach will not only protect disclosures but ultimately facilitate a deal, bringing more focus and calculation to the proceedings. For more information on how The Leadership Team can help contact us at contact@leadershipteam.info and someone will be in touch to discuss your business needs with you. Why you should consider an M&A? There are many ways that you can grow your company; scaling, innovation or strategic alliances to name but three. However, for many businesses, mergers and acquisitions are becoming the strategy of choice. Well, first off, M&A’s are much faster than organic growth. They can be a quick way for a firm to enter a new market, add new services, and gain valuable expertise. In addition, a merger or acquisition can sometimes help a company overcome some particular insurmountable barrier to entry or help it to acquire some intangible assets, such as a competitors particular unique branding that is a competitive advantage. Also there may be a business opportunity or threat that suddenly appears that requires radical and decisive action and an M&A might just be that strategy. Below we discuss five reasons to consider an M&A strategy to enable your organisation to maintain its competitive advantage. In today’s fast changing, increasingly highly regulated, complex business environments organisations are vulnerable to skill gaps, compliance issues and ultimately competitive weakness. In many cases a well thought through M&A can address these challenges as well as add value to the company. Allied to the first point, an organisation is only as good as the talent and expertise it employs. Mergers & acquisitions are also an effective way to acquire and secure valuable intellectual property (IP) which has become the new currency of modern business. In many cases the right merger can result in significant cost-cutting and/or money-making opportunities by taking advantage of overlapping operations or resources and consolidating them into one entity. By combining two organizations you can reduce competition in the marketplace, open new territories, offer access to new markets, expand customer bases and provide new sales opportunities, all of which can potentially increase revenue. Similarly, a strategic merger can effectively reduce costs by combining facilities, workforces, and business units. Joining forces with another company can create innovation in manufacturing, distribution, design and research and development. And so the purpose of a merger is to create a more satisfied customer. Ask yourself during the merger process, “How does my customer win?” If you can point to more customer service offerings, better pricing, innovative products and an improvement to the customer experience, then your merger makes sense. To avoid uncertainty and the risk of internal development, external acquisition can very often be the way forward and if properly planned will provide an immediate value that includes a turn-key, operational new service, along with a built-in customer base and target audience. So, should you consider an M&A as part of the growth strategy for your business? How will the merged firm generate organic growth? What other opportunities will exist for the new-and-improved organization? Will the ability be there to increase both revenues and profits long-term? If you can satisfy yourself as to the answers then you can determine whether this is the right growth strategy for your firm. For more information on how The Leadership Team can help, contact us at contact@leadershipteam.info and someone will be in touch to discuss your business needs with you. http://leadershipteam.info/wp-content/uploads/2018/08/The-LeadershipTeam-new-logo-1-e1534156173609.png 0 0 David Kitchen http://leadershipteam.info/wp-content/uploads/2018/08/The-LeadershipTeam-new-logo-1-e1534156173609.png David Kitchen2018-08-16 10:00:042018-08-16 10:00:04Why you should consider an M&A? In this blog we take a look at Mergers and Acquisitions (M&A). In simple terms this involves one company acquiring another by way of a takeover (acquisition), or two companies fusing to form a single larger entity (merger). The main reasons for a company to execute an M&A transaction are to grow its business (by acquiring or merging with a competitor) or add a new line of business to its existing activities. M&A can either be public (when it involves companies listed on a stock exchange) or private (when it concerns companies privately owned by individuals). In many cases it is wise to consider using the services of a merger and acquisition (M&A) advisory firm that can provide advice on corporate mergers, acquisitions and divestitures. According to Harvard Business Review (HBR) research, at a time when mergers and acquisitions are increasing at a much faster pace across all industries globally, the failure rate of such acquisitions can be as much as 90%. So how can you ensure success for your M&A? Firstly, it is absolutely vital that the process is completely transparent, realistic and involve all areas of management if success is to be achieved. Be clear from the very beginning on what matters and why. Where is the added value by doing the deal? Estimating synergies is key as by so doing you will also shed light on issues such as due diligence, the structure of deals, and the negotiations that lead up to them. As with any business deal it is invariably the case that there is a small number of actions that will have the greatest impact. So identifying them and focusing your resources on achieving those actions is key to a successful outcome. Merging or acquiring a company can be draining from both a human and financial perspective, and it can quickly spiral out of control if the businesses have not outlined what they wish to achieve for each stakeholder. So clearly defined goals are essential. Remember that you will be faced with challenges so make sure your strategy assesses the potential risks and complications that could arise during the process. Mergers and acquisitions require a high level of expertise so consider bringing in an expert who can assess the situation and the planned objectives without any favouritism or bias. An independent expert will help challenge claims, validate business decisions and ensure leadership stays on track in its goals. In addition, an independent expert should look to ensure employees receive the support they need through the merger or acquisition, and make people understand why the changes are taking place. If this isn’t done there is a risk that they will lose focus, become unhappy and potentially be disruptive for the company. http://leadershipteam.info/wp-content/uploads/2018/08/The-LeadershipTeam-new-logo-1-e1534156173609.png 0 0 David Kitchen http://leadershipteam.info/wp-content/uploads/2018/08/The-LeadershipTeam-new-logo-1-e1534156173609.png David Kitchen2018-08-08 09:30:122018-08-08 09:30:12What is M&A? In our latest update we take a look at how you can make degree apprenticeships work for you. Contrary to popular belief, apprenticeships aren’t just for new recruits at entry level. Older staff looking to upskill and progress are increasingly becoming interested in degree apprenticeships – and this is where the levy can help employers unlock the talent within their existing workforce. The apprenticeship levy can be used to train existing employees as long as the training meets an approved apprenticeship standard or framework and the proposed employee meets the eligibility criteria for apprentices. An independent Government study found that 56% of employers said that apprentices stayed in the business longer than other recruits, creating lower overall recruitment costs as a result. The same research also showed employers think apprenticeships build a higher level of commitment and loyalty than other employees. It’s believed that the positive impact apprenticeships have on employee retention results from a combination of the quality of the training provided and the ability apprentices have to learn and grow in the business from within. When the UK Government introduced degree apprenticeships in 2015, it created new routes to obtaining Level 6 and 7 qualifications – the same level as a full bachelor’s or master’s degree. This has enabled employers, for the first time, to be able to provide apprenticeship training at a higher level, progressing staff from junior roles to senior roles while in work. By giving older staff the opportunity to be developed through degree apprenticeships, employers are able to re-train them for career progression or upskill them to meet the needs of evolving job roles. This is especially important with the need for older staff members to develop digital technology skills This helps employers unlock the hidden talents of their staff to create a higher performing workforce. Higher and degree apprenticeship standards (designed to raise and standardise the skill level and competency of a range of occupations) are helping businesses build a skills pipeline to fulfil future roles. Currently, there are 147 new standards approved for delivery but employers can look forward to as many as 1,600 by 2020. As degree apprenticeships enable employers to gain valuable skills by developing staff via work-based training programmes, skills can be developed in highly-sought-after areas such as leadership and management and digital technology, and people can apply those skills to their role immediately. Building this pipeline of skills from within is a solid way to future-proof your organisation and ‘win’ the war on talent. Having a robust corporate social responsibility strategy not only provides an increased competitive advantage for businesses but is often now a necessity. Degree apprenticeships offer a prime opportunity to strengthen a business’s commitment to this agenda as they are an opportunity to improve social mobility with the potential to break down barriers and increase access to higher education for disadvantaged students, whilst also contributing to local growth and development. Interesting afternoon spent listening to some excellent speakers at the Westminster Employment Forum Apprenticeship Series– Funding apprenticeships in England – supporting employers, meeting demand and the future of the apprenticeship levy. Along with the recent AELP conference and many other events, it is evident that there is a perceived gap between Government Policy on apprenticeship levy and its implementation by training providers and employers. This is not a new phenomenon in that there is a wide history of government skills policy being perceived as out of line with the needs of employers and training providers. It is fair to say that there will always be a gap between the commercial drivers of employers and training providers and the societal needs that government must address in terms of social mobility and upskilling the nation’s workforce. Their mental mindset is that they see the new apprenticeship reforms as an opportunity rather than a barrier. Their prime focus is on giving the apprentice the best learning opportunity they can give and creating attractive progression routes. Their business development activities are based on not just being a supplier to the employer but becoming a critical partner in delivering the employer’s business objectives. One of the delegates asked the panel at the conference what needs to be done to move the levy from being a transactional policy to transformational policy. We truly believe that many of our clients are acting through the levy in a transformational manner. If you need any support in making your apprenticeship delivery transformational please get in touch with us at contact@leadershipteam.info. Are Degree Apprenticeships revolutionising Higher Education? Although launched in 2015, it is only in the last 18 months or so that degree apprenticeships have begun to gain some traction with employers and students alike. It has long been a complaint of employees that current graduates and/or degree programmes don’t provide the necessary skills that are required in the workplace and that many graduate entrants simply lack basic commercial awareness and soft skills. In addition since their foundation, the types of degree apprenticeships on offer have evolved away from mainly STEM (science, technology, engineering and mathematics) subjects and towards legal, consultancy and risk-analysis courses and this has began to increase their popularity. So is this a fundamental shift in the higher education model? Well although the more traditional universities are beginning to understand the changing dynamic away from the academic student learner to the student consumer, and therefore the need to change with the times, there is still a long way to go, especially in how such degree apprenticeship programmes will be structured. Also the need for universities to meaningfully engage with employers will provide a real challenge for those institutions that havent been used to having to be “commercially facing”, and although a lot of them have developed good links with businesses in recent years there is more that will need to be done, especially in the development of courses with employer involvement. It is also worth noting that in the UK we have often viewed apprenticeships as something inferior, the poor relation if you will to a university education but there is evidence now that that is changing. Major employers such as JCB, Ernst & Young and IBM are increasing their intake of apprenticeships. The JCB Chartered Manager Degree Apprenticeship for example has been designed for candidates who are passionate about studying Business Management at degree level whilst working within a highly successful global business and with a view to become a skilled JCB business professional. If we think about this shift in the relationship between higher education and the workplace is not surprising. The old world of free education, the 11 plus, grammar school or comprehensive, technical college/polytechnic or university, old 5-7 year apprenticeship or Red Brick University degree is now a far cry away from what is required to succeed in a world of tuition fees, artificial intelligence, skills shortages, global competition and greater economic uncertainty. For more information on how we can help in developing your training & development programmes contact the Leadership Team at contact@leadershipteam.info. http://leadershipteam.info/wp-content/uploads/2018/08/The-LeadershipTeam-new-logo-1-e1534156173609.png 0 0 David Kitchen http://leadershipteam.info/wp-content/uploads/2018/08/The-LeadershipTeam-new-logo-1-e1534156173609.png David Kitchen2018-07-10 09:58:182018-07-10 09:58:18Are Degree Apprenticeships revolutionising Higher Education? Launched in April 2015 to provide students with a university-level qualification and employment experience, while allowing them to share the cost of their education with employers. They move beyond the old-style “higher apprenticeships” by making a university degree a core part of the apprenticeship experience. What subjects can you get a Degree Apprenticeship in? Like a normal degree, a degree apprenticeship will last a minimum of three years, though some will be longer depending on the course. For example, some courses are “sandwich courses” which include a year working as an employee in the middle of the course and so can take 4 years to complete. What qualifications are needed to embark on a Degree Apprenticeship? The qualifications you need will vary from course to course. However, students should expect to need GCSEs and/or A Levels (or equivalent) which are related to the subject matter – such as science, IT or maths for example. For the student it is free and the cost of studying for this qualification is split between the employer who takes the student on, and the government. A real win for students. From the employers point of view there is no set cost for a degree apprenticeship, although the maximum amount an employer can use from their levy account is dependent on the Government funding bands for apprenticeships. With the introduction of the apprenticeship levy in April 2017, employers are now able to use this funding to purchase training for apprenticeships. The Government will top up employers digital apprenticeship accounts by 10% meaning that for every £1 that enters the account, employers will have £1.10 to spend on apprenticeship training. Employers who do not pay the levy will have 90% of their apprenticeship training costs subsidised by the Government. What are the benefits of a Degree Apprenticeship to the student? http://leadershipteam.info/wp-content/uploads/2018/08/The-LeadershipTeam-new-logo-1-e1534156173609.png 0 0 David Kitchen http://leadershipteam.info/wp-content/uploads/2018/08/The-LeadershipTeam-new-logo-1-e1534156173609.png David Kitchen2018-07-03 11:03:272018-07-03 11:03:27What are Degree Apprenticeships? The Leadership Team will be exhibiting at the Talent In Logistics Conference. The conference is designed to help businesses improve training in the logistics and transport industry, whilst also allowing businesses to meet with potential new suppliers. When is the Talent In Logistics Conference? It takes place on Thursday 21st June 2018 at Telford International Centre. If you would like to attend click here. Where can I find The Leadership Team at the Conference? You can find the Leadership Team at Stand 26. Here you will be able to find out more about the services we offer, including: Business Growth, Strategic Planning & Direction, Director Level Selection & Recruitment, Top Team Development, Leadership Profiling and Business Development. Will there be a workshop? Yes, at the Talent In Logistics Conference, you will have the opportunity to attend a Business Growth Workshop, and meet Chris Gibson our Leadership Specialist. The Business Growth Workshop will cover areas a variety of areas including, Financial Management, Project Management, Non-Executive Director Support, Legal Support and Marketing Consultancy. For more information on how The Leadership Team can help to grow your business email contact@leadershipteam.info or call 0845 303 9517. In many cases this is the most obvious scenario when you have to train your employees because of some to change to processes, products or regulation. In such circumstance there is a twin challenge of training in the new way of doing things, the technical side if you will, but also the need to get buy in from the workforce in a way that they will embrace the change. In addition you may have to train both the internal users (your employees) and external users (vendors, third-party service providers, etc.) which brings another set of challenges to be met. However, perhaps the biggest area is with new employees (Induction) who have to be trained in the policies, procedures, technologies, and know-how of a company to help perform their duties effectively. However, companies are known to postpone these training sessions until the time they have several new hires that can be trained in a batch. This means that during the interim period, some new employees start working at their jobs with inadequate knowledge or skills. This is risky for a business. At other times, companies are compelled to arrange for ad hoc one-on-one training sessions, which can be costly and can result in inconsistent messages being delivered. Of course, an employee may have the basic skills and knowledge but lacks application to carry out their roles effectively. This is a more complex problem and may involve a combination of training interventions couple with an effective performance management programme. The question for employers here is, are your managers sufficiently skilled in managing performance? 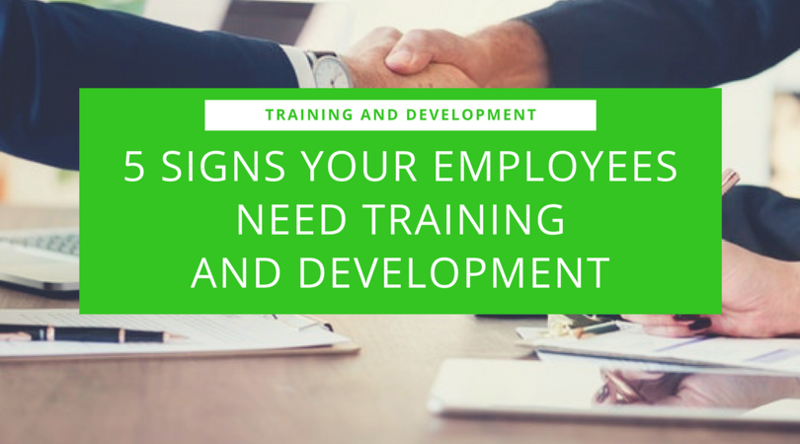 Investing in ongoing training for employee learning and development is a great way to close these skill gaps that tend to destroy business efficiencies while also boosting employee motivation to advance further in the company. Sometimes employers think that the only option when addressing a skills gap issue is to recruit externally. However, it is often the case that within your organization there are talented employees who can be trained to take on additional responsibilities or learn the required skills of a higher position. This let’s you address a skill gap without searching for the perfect external candidate (who doesn’t exist anyway)to appear and then spend time and effort to make him learn your company culture and policies and procedures which an existing employee already knows. In an increasingly competitive market place with ever changing market conditions, increased customer demands and new technologies organisation are having to raise performance standards like never before. This means upskilling your workforce through learning and development programmes that will bridge the skill and/or knowledge gap. For example, enhancing quality standards or implementing a new customer service approach. Along with globalization, competition and increasing demands for organisations to operate with transparency and good governance comes more and more regulation. New legislation or policies demand training for employees so that they can comply with the standards and businesses does not risk falling foul of the law that might bring sanctions and financial penalties. Remember, it is the responsibility of the senior teams in organisations to be alert to changes in those factors – external and internal – that can impact on workforce effectiveness and to ensure robust procedures are in place to offer the necessary support and training in a sustainable and ongoing way.